The Suncrown 6 Piece Wicker Outdoor Sectional Sofa Set with Waterproof Cover is a great value patio sofa set, that lets you enjoy resort-style comfort in your own backyard — providing luxurious sofa seating for four to six guests, a glass-topped coffee table, and uniquely, a waterproof cover to protect the set when not in use. 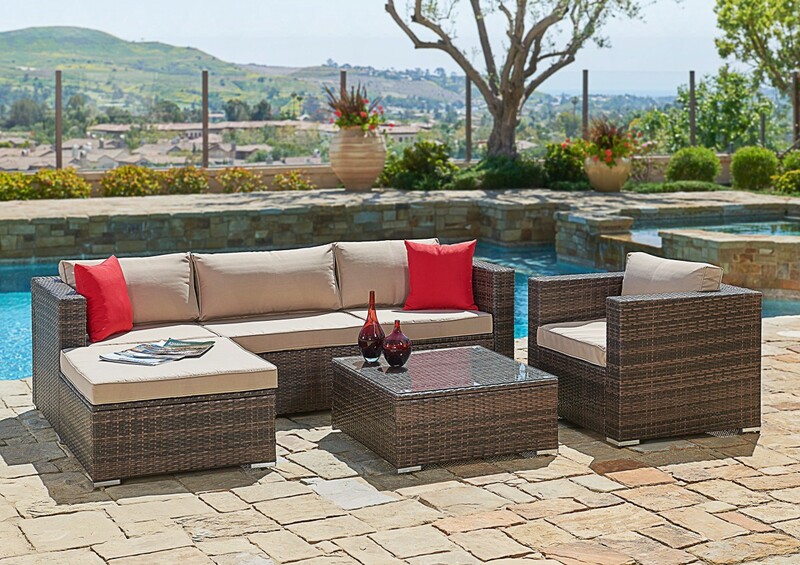 Crafted with high-quality, all-weather resistant, resin wicker (with an authentic-looking brown checkered pattern), and rust-proof aluminum frames (with metal feet for extra protection), the Suncrown 6 Piece Wicker Outdoor Sectional Sofa Set with Waterproof Cover is built to last with outdoor environments in mind, for years of enjoyment ahead. 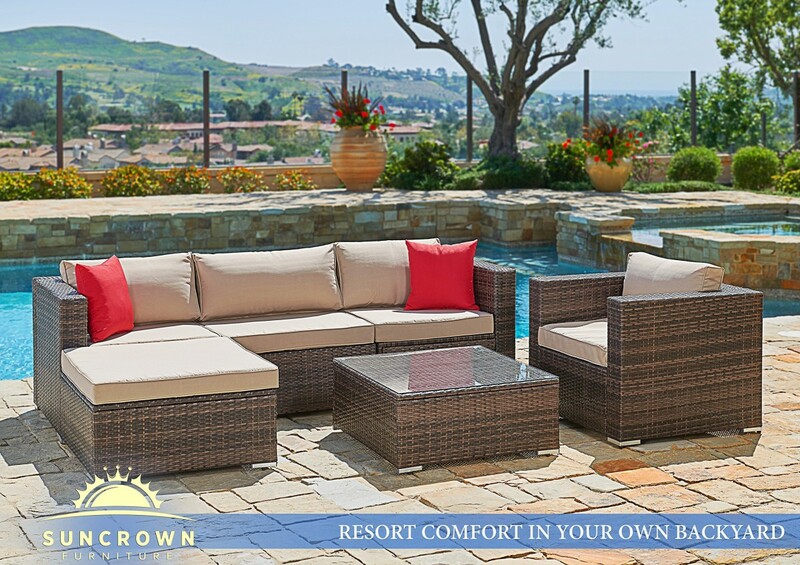 With the ability to be placed in an endless number of configurations, to suit your living space and personal preferences, the Suncrown 6 Piece Wicker Outdoor Sectional Sofa Set with Waterproof Cover can also be re-adjusted in the future should your needs change, and will look right at home in any space — whether that be out on your patio or deck, or in your garden or yard. 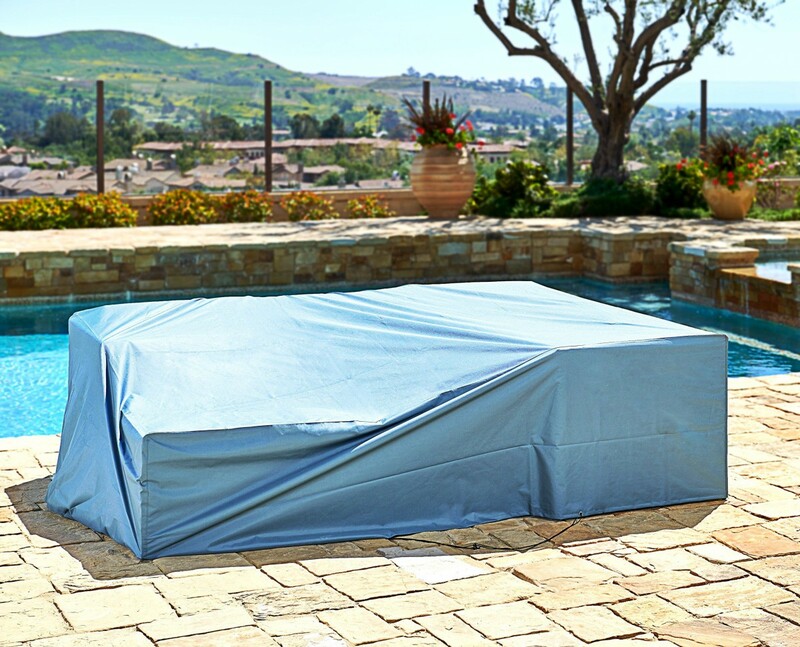 Including unzippable, removable, water-resistant cushion covers that are machine washable, so you can simply unzip them and throw them in the washer to keep them looking brand new, the Suncrown 6 Piece Wicker Outdoor Sectional Sofa Set is easy to clean and maintain and also includes ultra-plush cushions that resist water, and which won’t collapse after use. 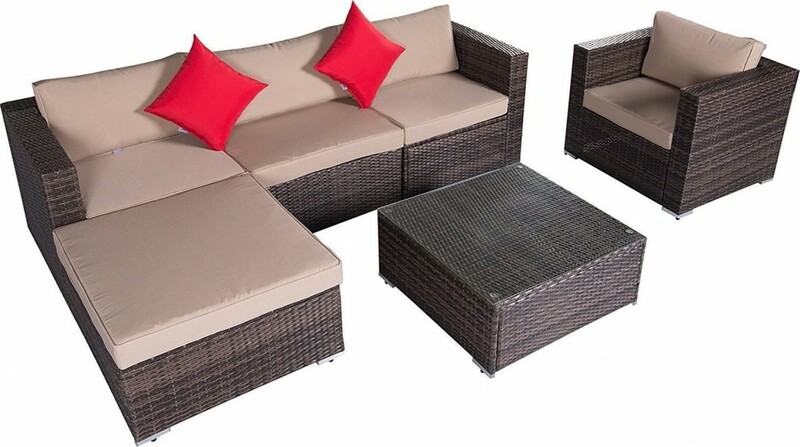 Including six seat clips/clamps, which attach to the underside of the sofa to keep the sofa pieces from sliding apart while in use, the Suncrown 6 Piece Wicker Outdoor Sectional Sofa Set with Waterproof Cover is an outdoor seating set that is sure to bring about many compliments from neighbors and friends, and if you ever need to adjust the configuration for visitors, simply unclip the clamps and reposition as required. Complete with a bonus full-sized, professionally-fitted, waterproof cover and carrying case to keep your chairs and table clean and dry (which with other sets, typically needs to be purchased separately), the Suncrown 6 Piece Wicker Outdoor Sectional Sofa Set has everything you need in one package, and is ready to transform your leisure time, and bring life to your patio, deck, porch, backyard or poolside space. 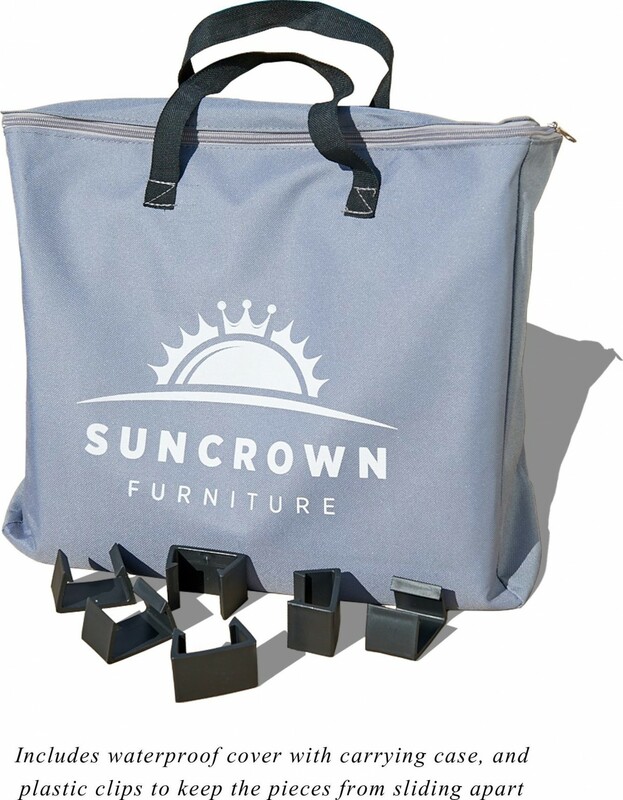 With quick and easy assembly that should take around 45 – 60 minutes with the included Allen wrench (faster still if you use a socket wrench), the Suncrown 6 Piece Wicker Outdoor Sectional Sofa Set with Waterproof Cover is produced by a company based right here in the United States, for dependable support you can trust, and is a best seller over at Amazon.com (rated 4.8 out of 5 stars from 19 customer reviews) with FREE shipping. Click to see current price.